Smelt are oily, and their flesh has a soft texture. Their odor is like freshly cut cucumber. 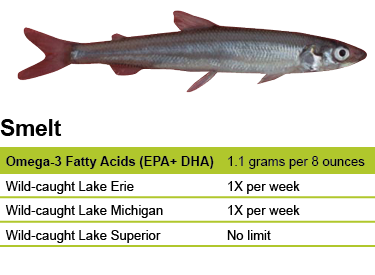 Lake smelt are considered less oily than saltwater smelt. Most smelt are headed and gutted, but people eat them with the bones intact. They have omega-3 fatty acid levels (EPA and DHA) more than twice the levels in Atlantic cod. Smelt are caught by gill nets close to shore as they migrate to spawn in rivers. In Minnesota, they can be seined from the shore. There is a trawl fishery for smelt in the Two Rivers area, although the smelt population in Lake Michigan has recently been extremely small. State health agencies have found that it is safe to eat Lake Michigan and Lake Erie smelt once a week. Lake Superior smelt are unrestricted. Rainbow smelt are small, silvery fish from the Atlantic Ocean that spawn in fresh water. They were planted in Michigan’s Crystal Lake in 1912, and they made their way into Lake Michigan and the rest of the Great Lakes. Smelt numbers in the Great Lakes increased dramatically as sea lamprey reduced or eliminated top predators like lake trout. Like salmon, smelt run upstream to spawn, and for many years, smelt provided a recreational opportunity to anglers who netted them with dip nets at night in Great Lakes tributaries. Smelt populations in the Great Lakes are no longer as large as they once were and smelt dipping has declined. Smelt are so fatty that Native Americans used them as candles. When dried, placed upright, and lit, the fish would burn from end to end.